Retaining walls offer a wide range of benefits to any landscape. To get the most out your retaining wall, it is important to know what to consider prior to designing one. 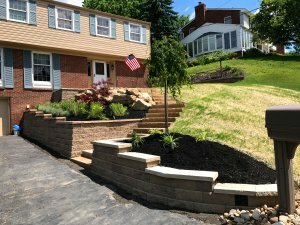 Properly designing and building a retaining wall is crucial to keep the wall visually appealing and to help ensure it serves its intended purpose for years to come. Materials- You want to select the type of material that best suits the purpose the wall will serve. For example, for landscape use, there are long-lasting options such as flagstone rock that can withstand the elements. Type of wall- This will be determined by your needs. A structural wall that is poured in place will be best for more utility type jobs while a dry-laid wall will be stacked and open-jointed and work best for more decorative purposes. Location- This should be planned carefully before any work is done to save you the time and expense of relocating or modifying the wall once it is built. Drainage– Lack of drainage can cause your wall to fail due to water and soil moisture build-up. Retaining walls should allow for the water to freely drain down and away from the wall by using gravel backfill or drainage blankets and drain pipes. Foundation– The wall should be built on a foundation made of sound materials, such as compacted earth or gravel fill. Batter– Higher walls should be built to lean or lay back into the retained slope to make the wall more secure. The amount of adjustment from true vertical is referred to as the batter of the wall. Anchors– Walls made from solid horizontal materials typically have T-anchors extending through the slope and anchoring into the undisturbed ground behind it. This helps the wall resist the pressure that can force the wall forward or cause it to pivot. By keeping these factors in mind, you can have a beautiful and functional retaining wall for years to come. At Treesdale Landscaping Company, our experts have the knowledge and experience to ensure that your retaining wall project is done right, giving you a functional and stylish wall for years to come. Call us today to start your retaining wall project.